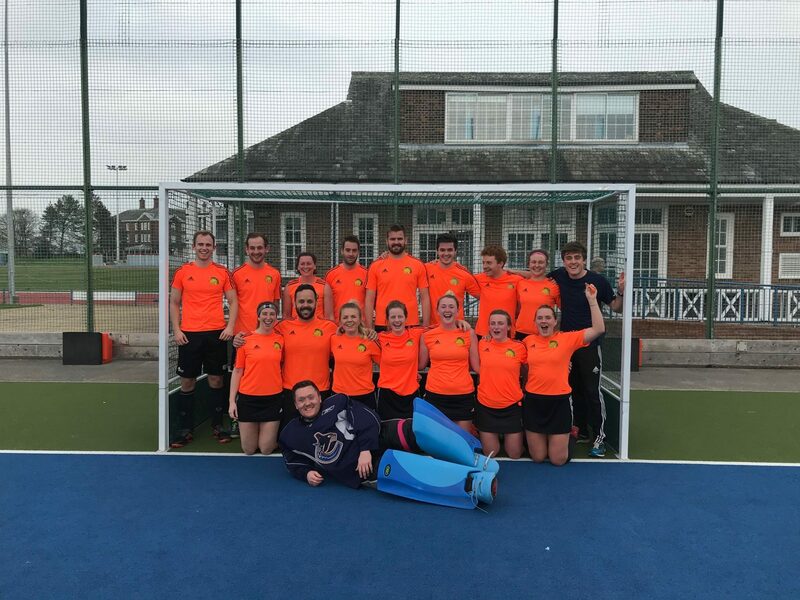 For most clubs the hockey season is all but over, league campaigns done and dusted and a time for reflection on another year of highs and lows. At Adel we probably expected the same for us and hence the installation of the new fencing and dugouts was booked in for the month of April, traditionally a quiet month for the club other than the AGM (8th April) and deciding what outfit to wear for the End of Season Dinner (11th May). For the last couple of seasons we have entered a couple of mixed teams into the EH national cup, perhaps more in hope than expectation, and this has been an excellent way to continue with the integration of the mens and ladies sections as well as dragging people out of beds after another late Saturday night socialising. The mixed 2nd team were perhaps unfortunate to enter a higher level competition and in their 2 away games at Huddersfield and Sunderland they found themselves up against strong sides who were better prepared and drilled. The mixed 1st team were also unfortunate in the first round to draw local rivals, Ben Rhydding, who are a couple of leagues above our mens and ladies teams. In a close game, Adel were unfortunate to lose to a sudden death penalty stroke in the shoot out but the good news is that in the EH cups you get a second chance and the first round losers go through to another competition with the opportunity to still play at the Olympic Lee Valley venue in June. In the next round we were fortunate to have another home draw and the team eventually ran out with a comfortable 4-1 win v Durham to set up a last 16 round match away at York – the night after the club Blackout social which perhaps meant the end of the road to Lee Valley with most of the team partying well into the Sheffield night. However, the Adel spirit and togetherness saw the side defend valiantly and an Edd Holford goal the day after leading the 2s to the Yorkshire Division 1 title pulled Adel through to yesterday’s home quarter final against Golborne. If like me, most of you had not heard of Golborne, they are an up and coming team from near Wigan and a quick look at their website and the North West league tables would have given a strong indication of a club on the up with both mens and ladies sections doing well in the last couple of seasons. There are no easy games in the quarter finals of any competition, most of all an EH national cup. So with the Adel pitch out of service due to the lack of fencing, coach Sam Jackson scouted around the area to find a suitable venue and a 2.15 slot at Becketts Park was booked to follow Leeds Ladies in their National League play off game v Olton and West Warwicks (4-0 to Olton if you were wondering…). The Adel team looked better prepared this time than for the previous game v York and with a strong squad to choose from, coach Jackson had some tough calls to make for a place in the match day squad. After a rousing Presidential Address from Ian “Sniffer” Phillips, the players went through an intense warm up in front of a large sideline crowd, predominantly made up of nervous parents, partners and club members eager to see the team progress. The depth of support from every team at the club was great to see. The Adel squad tell you everything you need to know about Adel as a club. Four of the 16 began their hockey careers in the Under 10s or 12s at Adel, have been away to University but all returned to play for the club with Gareth Maver fit to return from his broken collar bone injury and the back line of both Powleys (Sophie and Will) and Hannah Jones putting into practice all they have learnt over 15 years or more at the club. Ladies club captain, Gabby Nusenbaum, girls under 10s coach Jenny Wright, club social secretary James Moorhouse provided some committee representation, new club members Rich Hinds, Tom Scott, Sophie Bell and keeper Jack Stephenson have quickly settled into the Adel way of playing and James Stroomer brings a wealth of experience from his time playing at Birmingham University. Luke Meaton and Tom Scott provided some evidence of the strength in depth at the club with both of them yet to play for the mens 1s and Becky Louth and Jess Richardson gave some midfield solidity, energy and commitment. The game began nervously with both sides looking to take a hold on the game. The bounce on the pitch was also something both sides were looking to overcome and there were few chances in the opening exchanges. It was clear though that Golborne were well organised, had a pace threat in their forward line and were able to soak up some early Adel pressure with a threat on the counter attack. Adel’s early threats came via the well distributed aerial balls from Will Powley with the bounce catching out the opposition on several occasions but sadly also the Adel forward line too. Finally after 15 minutes Adel created a chance in the circle and goal machine Moorhouse in front of his watching parents, sister and nephew, broke the deadlock with a well taken finish after a couple of saves by the Golborne keeper. The first half saw further chances spurned by the Adel forwards and Hinds was given a 2 minute suspension for over-zealous tackling on multiple occasions but the Adel defence held out despite being a man down. Keeper Stephenson had little to do in the first half as the Powley – Jones – Meaton back line stood firm to repel the Golborne attacks. The second half saw Adel apply early pressure and Moorhouse and Stroomer combined to overturn the ball in a dangerous position with a penalty corner about to be given in their favour, however an excellent advantage from the umpire allowed the game to continue and to the delight of the watching Adel faithful, Jenny Wright dived full length at the far post to grab the second goal. A two goal cushion gave the crowd some relief and relaxation but not for long as Golborne regrouped immediately and within no time at all they had scored not just one goal but a second as well to bring the scores level again with around 20 minutes to go. Momentum had now shifted to the opposition, but fortunately the 12th man of Adel continued to roar support from the sidelines and encourage the team to believe they could still grab the all important next goal. Golborne then won another penalty corner and when the first shot was hit by one of the male players a lengthy debate took place over the rules of mixed with the majority of the view that only ladies could strike short corners first. After a consultation involving coach Jackson, the umpires and the Golborne skipper it was agreed than men could strike at penalty corners and Adel then promptly won three corners in quick succession with the goal threats of Hinds, Stroomer and Powley all keen to get on the score sheet. However, the Golborne keeper pulled off a string of saves and with time running out, Golborne were awarded a late penalty corner much to the disbelief of the Adel players and crowd. The Golborne drag flicker stepped up but was thwarted by the Adel defence once more and with flicks to decide the winner looking inevitable, the umpires having signalled less than 2 minutes to go, Adel had one final chance to steal the win in normal time. For a few of the team, late goals have already been the salvation this season with late equalisers for the mens 2s in both their games v Leeds being important enough to decide the destination of the league crown. Now there was further last minute drama as Stroomer found himself unmarked wide to the left of the goal – most of us have seen how devastating he can be on his reverse stick from this angle but on this occasion he was on his open stick and his undercut shot looked to be going well wide of the goal (perhaps eyesight still somewhat blurred from the previous days excesses!?) until Rich Hinds more in self preservation somehow got a stick on the ball and deflected into the goal to give Adel a 3-2 lead with seconds remaining. The final whistle followed shortly after and the 100+ strong crowd let out an audible sigh of relief as the team on the pitch celebrated wildly. Fair play to the gallant Golborne who battled hard and look to be a club like Adel with a strong social side accompanying their recent league successes. Both umpires also managed the game brilliantly and the crowd didn’t let Adel down from the sidelines with continuous support and encouragement. As the Adel contingent headed back to AWMA to start their celebrations, lots of searching on the EH website eventually revealed that the semi and finals weekend is 8th and 9th June at Lee Valley. It looks like Horsham, UK Fire Service and Bristol Firebrands will also be there trying to end the season in style at the Olympic venue of 2012. Conversations soon moved on to travel plans, hotel accommodation and extra training sessions with Sam and Gabby considering private jets and Air B n B. Whatever happens on the pitch at Lee Valley in June, it promises to be a great weekend and the first time the orange colours of Adel will be represented there. I am sure there will be a huge Adel turnout wanting to enjoy the weekend so watch this space for further details to avoid disappointment. As ever, thanks to everyone who helped make yesterday a success on and off the pitch, from the watching faithful to those players who have played in previous rounds but missed out yesterday through injury or selection. It was great to see the Adel club spirit out in force once more.